The hills of Abruzzi and the zone that lies the mountains to feet are areas, which are full of natural reserves and protected areas, as the Natural Reserve Castel Cerreto, the Calanchis of Atri – natural architectures also known as “bedlam” or “scrimoni” born for the erosion of the clayey ground because of the cut of woods and favorited from dry weather and ever changing sea-level, that make visible numerous sea fossils – and the Equiopped Territorial Parks of Fiume Fiumetto and Vomano. 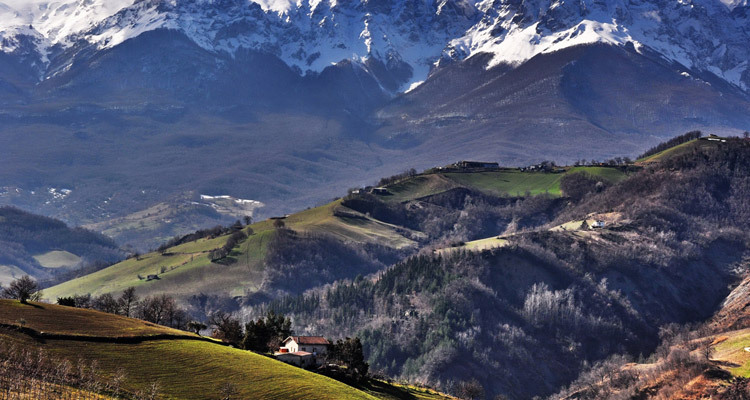 L’ hinterland of Abruzzi entertains besides city of uncontested historical and artistic value, refined artisan shops, foods and wine cribs of manifold traditional products, but also a modern industrial district – Val Vibrata – with numerous otlets and first-class textile industries. Atri: Atri was a pre-Roman town, subsequently colonised by the Ancient Romans with the name of Hatria. It is an art city of matchless beauty and has a great history to recount. As early as 1251 it was a diocesan see and for a long period it was the feud of the Acquaviva family. Its glorious history is demonstrated by its numerous monuments that include the magnificent and important Romanesque Gothic cathedral of Santa Maria Assunta, splendidly frescoed by Andrea De Litio, and containing Abruzzo’s largest organ. Arsita: Located within the Park itself, this mountain village has most ancient origins, to which an eventful history bears witness. The medieval castle is of particular interest, as is the church of Santa Vittoria and the abandoned Santa Maria d’Aragona. The presence of an old restored mill, on the River Fino, proves the rural nature of its economy. Campli: Located within the Park itself, on one of its hillsides, Campli is a splendid art town that boasts an extremely ancient history. The first settlement was erected in the pre-Roman epoch, even though the town did not acquire significance until between the 1300s and 1400s. It was also a fief of the Farnese family. Its monuments include the church of Santa Maria in Platea, the Sacred Staircase and, in the Campovalano district, the church of San Pietro, as well as an extremely ancient necropolis. Castel Castagna: A fortified village of the Dark Ages, set in the heart of the ancient Valle Siciliana. Castel Castagna is now discovering that it has a tourist vocation, not only attributable to its unadulterated nature, but also to the presence of important cultural sites that include the lovely and notable abbey of Santa Maria di Ronzano. Castelli: Located within the Park itself, on the foothills of Mount Camicia, legend has it that the town was founded by the Etruscans who practiced the art of ceramics. The ancient talent of Castelli potters is demonstrated by an immense and most precious production, but also by the splendid ceiling in the chapel of San Donato, defined by Carlo Levi as the “Sistine Chapel of majolica”. Cermignano: The village dates back to the Middle Ages, even though evident traces of Italic-Roman settlements have come to light. Cermignano was the victim of numerous dominations that concluded with that of the De Sterlich in the 1700s. Worthy of note is the handsome, triangular, medieval Montegualtieri tower. Civitella del Tronto: Located within the Park itself, the village is dominated by the splendid fortress that symbolises Civitella’s entire history. The fortress was built around the year 1000 and strengthened in the 1400s, being the final Bourbon outpost to surrender to the emergent Kingdom of Italy in 1861, after a lengthy siege. The village is enhanced by numerous churches in the old centre and the surrounding area, including: San Francesco, Santa Maria dei Lumi, San Lorenzo and the Abbey of Mount Santo. Colonnella: Located near the River Tronto, the village arose in the Dark Ages. Set gently on its hill, Colonnella presents a beautiful architectonic layout, dated 16th century, which distinguishes the old centre. Its flourishing economy, founded on agriculture and service industries, makes it one of the most prominent communes in the development of the Val Vibrata. Controguerra: This Vibrata village was built during the 5th century in order to offer a safe refuge for neighbouring populations put to flight by the barbarians. Controguerra stands out for its lively economy and as a matter of fact it is linked to one of Abruzzo’s three vines – the “Controguerra” type – which in 1996 became a recognised D.O.C. grape. Corropoli: Situated not far from the mouth of the River Vibrata, the village has extremely ancient origins, proved by the discovery of Neolithic village in the Ripoli district. There is no lack of monuments, including the splendid abbey of Santa Maria di Majulano, built by the Benedictines of Montecassino, and Santa Agnese, with the top of its bell tower covered in precious Castelli ceramic tiles. Among the historical representation we have to remember the palio of the barrels. Montorio al Vomano: The numerous traces uncovered demonstrate the town’s Ancient Roman origins, although the current layout is probably datable between 11th and 12th century. There is no lack of interesting monuments, including the parish church of San Rocco and the incomplete Forte San Carlo. This commune is considered the gateway to the park and has discovered this new vocation for environmental tourism. Nereto: Set on the left bank of the River Vibrata, the village, located on a hill, is clearly of medieval stamp, although it has been populated since the Neolithic. Monuments include, not far from the centre itself, the lovely church of San Martino, dated 12th century. Nereto is an economically thriving member of the Val Vibrata industrial district. Pietra Camela: Located within the Park, Pietracamela is one of the province of Teramo’s more fascinating communes. It is set on the foothills of Gran Sasso and little is known of its origins, although human interventions can be seen even in ancient times in the numerous monuments and characteristic stone dwellings. Prati di Tivo, a well-known holiday resort, popular with winter sports enthusiasts, is part of this commune. Rocca Santa Maria: Located within the Park, the village has medieval origins and a rich tale to tell, for it was a bulwark of Bourbon resistance during the Unification of Italy. Moreover, in 1943, the nearby Bosco della Martese (legend has it that the woods were crossed by Hannibal) was the theatre of a violent clash between Italian partisans and the German army. The woods are just one part of the splendid nature that distinguishes this territory. Sant’Omero: The village was a fief of the Acquaviva family for many years and is of evident medieval stamp. One of Abruzzo’s most ancient and best preserved churches, Santa Maria a Vico built well before the year 1000, is built on the hills out in the territory of Sant’Omero. As well as its flourishing agriculture, the centre boasts numerous industrial activities. Teramo: Capital of the Province and splendid art city. Teramo’s glorious past is demonstrated by its lovely monuments that guarantee its charm: not to be missed. The impressive Duomo, dedicated to Our Lady of the Assumption and to St Berardo, dominates the centre. Numerous archaeological sites offer proof of the city’s splendour in Ancient Roman times, especially under the Emperor Hadrian. Tortoreto Alto: The suburb of medieval origin is situated on a wonderfull hill that stands 227 mt. from the level of the sea and is a real natural terrace on the Adriatic. Inhabited since prehistory, testified through the recoveries of simple villages and small burial places of neolitic age, Tortoreto is an important testimony of Roman age too, between republican and imperial age, a rustic villa with floors in mosaic and and rooms turned to the workmanship of grape and olives. The suburb is characterized by a beautiful medieval historical center, separated into two historical neighborhoods of Terranova and Terravecchia, embellished by the presence of numerous monuments. Among the demonstrations it is to remember the historical rievocazione of the Palio of the Baron, rich representation of dances, games, flag-players and people in luxuriant suits of epoch with attached Banquet. Valle Castellana: Located within the Park itself, this is a town of medieval origins. It is rich in history made of hermits and brigands, until the Bourbons chose the place as their stronghold. The unpolluted nature, wonderful monuments and deserted villages of Valle Castellana offer an ample range of tourist potential that attracts visitors all year round.